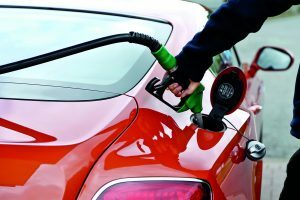 FUEL CARDS – SHOULD YOU GET ONE? When running a business, the issue of fuelling company vehicles is probably not the first thing on one’s mind. Indeed it’s probably more comfortable to try not to think about it, seeing as it’s another overhead that the company could do without. On top of that, keeping track of receipts for accounts purposes or to reimburse staff creates an administrative headache. This is where fuel cards come in. Or rather, came in. Fuel cards have been around for decades, and aim to simplify the process of keeping a company vehicle fleet topped up with fuel by consolidating invoices. 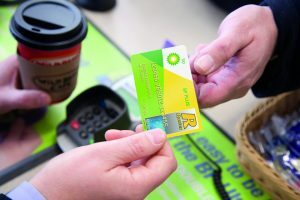 A fuel card is essentially a credit card which is restricted to the purchase of petrol or diesel, plus some vehicle accessories depending on the type of card owned. The fuel card company then pays for a fill-up transaction, and sends the invoice to the company that the fuel card is registered with. These invoices tend to be weekly, and mean that hours once spent sifting through hundreds of receipts to reclaim VAT can be used more productively. 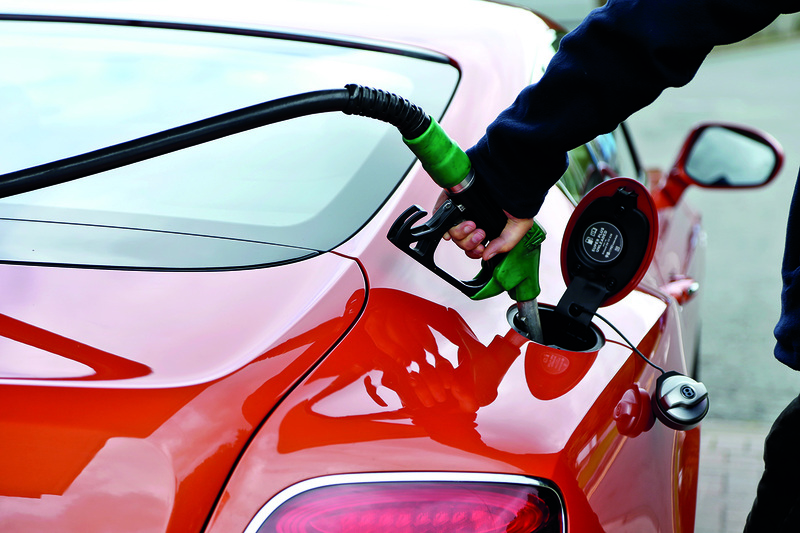 Many fleet operators now use fuel cards. But for those who don’t, it’s a question of knowing when to start. There are many different types of fuel cards available to suit the type of business one might be running, from SMEs to large, nationwide fleets. BP, for example, offers its BP Plus card or fleets who need maximum coverage with a cross-acceptance partner network including Texaco, Gulf and Esso. Alternatively, there is the BP Plus Bunker specifically for bus and truck fleets who use key motorway and A-road routes. Fuel cards aren’t without their faults. Just like any other payment card, there is a risk of fraud associated with their use, despite efforts to make the platform as secure as possible. For instance, if a fuel card is stolen or lost, then what’s to stop anyone picking it up and purchasing fuel on a company tab? For one thing, notifying a fuel card provider of a lost card as soon as possible is a crucial step. But there is further security on top of this. Another concern is with the providers themselves. There is a concern among fuel card users that prices can rise if they don’t pay attention, as Shortis highlights: “The only downside is that some of the fuel card providers try to get one over on you – either alter their terms or say ‘oh, by the way we’re putting in a charge now so if you want to use a card it’s gonna be x number of pounds per use’ or whatever,” he said. This certainly isn’t exclusive to fuel card providers though, and many readers can probably tell of similar stories with their electricity, internet or phone bill provider, for instance. This is a nuisance, to be sure, but the way of tackling the situation is the same: negotiate the price down, or threaten to switch providers. “We have switched providers and they’ve come back pretty quickly saying ‘oh, we didn’t actually put that in!’” says Shortis. “Everything’s up for negotiation, or sometimes they don’t negotiate until after you’ve switched.” It’s worth keeping that in mind if ever you notice mysterious charges on your invoice. Plus, regularly keeping in touch with your provider to negotiate a better deal might be a good idea as well. Food for thought, whether you operate a one-van fleet or dozens of electric minivans. Late last year, a motor industry employee was given a six-month prison sentence for accessing thousands of customer records containing personal data without permission, using his colleagues’ log-in details to access a software system that estimates the cost of vehicle repairs. The UK’s data protection regulator, the Information Commissioner’s Office (ICO), brought the prosecution under the Computer Misuse Act 1990. Most cases are usually prosecuted by the ICO under the Data Protection Act. However, in some cases, it can prosecute under other legislation—in this case section 1 of the Computer Misuse Act — to reflect the nature and extent of the offending and for the sentencing court to have a wider range of penalties available. In this instance, Mustafa Kasim had accessed the records while employed at Nationwide Accident Repair Services and continued to do so after he started a new job at a different car repair organisation which used the same software system. Kasim pleaded guilty to a charge of securing unauthorised access to personal data between 13 January 2016 and 19 October 2016, at a hearing in September 2018 and was sentenced at Wood Green Crown Court. Of course, as is well known, the law in this area changed when the General Data Protection Regulation (GDPR) came into force in the UK in May 2018. The GDPR governs how businesses (known as data controllers) handle the personal information of their customers and employees. It significantly strengthens the regulation of data controllers – providing the ICO with powers to impose substantial fines for non-compliance. It also provides individuals with an array of rights which consumers and employees can look to enforce via the courts. The new law is, in part, intended to force a cultural change in how we think about and protect people’s personal information. It is also intended to bring the law up to date with advances in technology as well as the widespread use of internet-based applications and social media. There are huge financial penalties available to the ICO for cases of non-compliance – with fines of up to 4% of a company’s annual global turnover for the preceding financial year or the equivalent of around £18 million – whichever is greater. Some businesses have already adapted their systems and processes for the new law, however, many others will either still be in the process of making the required changes or will not have begun yet. Sadly, some may still be unaware that the law has changed. In any event, it is crucial to ensure that an organisation is compliant with the new law – particularly so that customer and employee data is handled safely and securely – reducing the risk of information being misused and the company’s reputation suffering as a result; the risk of being hit with a substantial fine from the ICO for non-compliance is reduced; and so that the risk of the company being sued by an individual or a group of individuals, who may have been adversely affected by a data breach, is also reduced. On this it’s worth noting, as the BBC has reported, that supermarket Morrisons has been found vicariously liable for a data breach that saw thousands of its employees’ details posted online. Workers brought a claim against the company after an employee stole the data, including salary and bank details, of nearly 100,000 staff. While he was jailed for eight years in 2015 after being found guilty at Bradford Crown Court of fraud, securing unauthorised access to computer material and disclosing personal data, the ICO found that Morrisons had not breached data protection law. Firms should consider where, when and how they process personal data. They should map their processing activities so they can identify all types of data processing that the company carries out. They should then seek to ensure that they have a lawful basisfor each type of processing that they are conducting. The lawful bases for processing are: ‘consent’, ‘performance of a contract’, ‘legal obligation’, ‘vital interests’, ‘public interest/exercise of official authority’and ‘legitimate interests’. Whether one of the above applies to any particular type of processing will depend entirely on the circumstances. Additional conditions also apply to any processing of ‘special categories’of data – such as information about a person’s health – which is prohibited unless further conditions are met. Data processors are those who process personal data on a someone else’s behalf. A good example of this is where a company outsources its payroll to an external company. In that instance, the external company is a data processor. The law requires data controllers to ensure that they only appoint data processors who have provided sufficient guarantees regarding their GDPR compliance. The law also requires that this relationship be governed by a contract that sets out the parties’ data protection obligations. Those that market directly to individuals must ensure that they have a lawful basis in order to use personal data for marketing purposes. An example of this is where firms send marketing emails to a person with their consent. It is not always necessary to have consent before marketing directly to people, however, this will depend upon the specific circumstances. Firms must comply with the GDPR and other legislation including the Privacy and Electronic Communications Regulations (PECR). Businesses should ensure that they provide a Privacy Notice to individuals when they first collect their data. The Privacy Notice should explain who the business is, provide its (and the Data Protection Officer’s) contact details, purposes for processing people’s personal data and details of the legal basis upon which the business relies upon for processing the data. It should explain the details of any ‘legitimate interest’that it may rely upon for processing data as well as the details of any third parties that the data may be sent to. Finally, it should also set out the details of any transfer of personal data that might occur to other countries and inform individuals about the rights they have under the GDPR. Individuals have numerous rights under the GDPR such as the right of access, the right to rectificationand the right to erasure. If a firm receives such a request from an individual, it will be important for it to ensure that it responds to the request appropriately and within the one-month time limit. Ensuring that it has policies and procedures in place to facilitate the handling of a request is important in order to ensure that the request is handled correctly and in order to be able to actively demonstrate compliance with the law. Businesses should ensure that its systems for processing personal data – both off and on-line are physically secure – utilising appropriate technical and organisational measures. Systems should be tested regularly. It may make sense to use a reputable IT company to test the security and integrity of the firm’s IT systems. The vast majority of data breaches are the result of human error. Ensuring that staff are trained in relation to data protection issues and that the business is able to demonstrate this in the event of a data breach are critical steps towards preventing a breach from occurring in the first place. It may also help in avoiding a financial penalty from the ICO in the event of a breach. Businesses should train all staff and conduct annual refresher training. This is mandatory in some instances – particularly if the business’s core activities consist of regular or systematic large-scale monitoring of individuals. However, even if it is not mandatory, the business may still wish to appoint a DPO in order to ensure that a single person takes responsibility for ensuring compliance. A DPO must be appointed on the basis of professional qualities and, in particular, expert knowledge of data protection law. A DPO must also meet certain minimum tasks and responsibilities set out in the GDPR. Personal data breaches must be reported to the ICO within 72 hours unless the breach is unlikely to result in a risk to the rights and freedoms of individuals. It is, therefore, important that the firm has an appropriate process in place to promptly analyse a data breach, reach a determination on whether it is mandatory to report the breach, and doing so where it is necessary. If a proposed data processing activity is likely to result in a high risk to the rights and freedoms of individuals and where a type of processing utilises new technology, the business must conduct a Data Protection Impact Assessment (DPIA) before it begins that processing. A DPIA is a risk assessment aimed at identifying potential risks in the proposed processing of personal data in order to enable a data controller to address and minimise those risks if it is appropriate to conduct the proposed processing proposed. A DPIA must be documented. The law is quite clear on what it expects and the punishment that it will mete out if the rules aren’t followed. As recent cases have shown, both individuals and companies alike can face action. These are challenging times for our industry, with consolidation showing no signs of slowing down, along with concerns about the ‘B-word’ and the economy in general, business captains have their hands tightly on the rudder trying to navigate these choppy waters. Unfortunately, uncertain times usually result to price wars which can lead to ‘buy cheap’ sell for ‘as much as possible’. This has led to a massive growth in ‘white box’ and ‘plain label’ products to the detriment of established, and, often, British brands, with the cheapest option being Far-Eastern copies. This trend is decimating the remanufacturing industry, since being so labour-intensive, it cannot compete on price, and distributors do not have to worry about surcharges and control of old-core. The result has been the loss of a complete industry in the UK, along with jobs and the support industry behind. Remanufacturing is no longer an ‘under the arches’ operation; it is a highly-technological and professional industry requiring skill, knowledge and investment. In addition to producing equivalent to or better than original equipment (OE) specification products, it has significant environmental credentials, which should be a major concern to all, so that we can protect the earth and its resources for future generations. The basic raw material is the old part which would normally be scrapped. However, in the remanufacturing process this is fully stripped and re-worked with all wearing, faulty and parts prone to failure being replaced. The finished product is then tested to at least OE specifications using the latest computerised test equipment to ensure that it meets the strict performance levels, before being packed and ready for sale. Each remanufactured part usually has at least a one-year warranty with many companies, such as Autoelectro, offering an extended warranty. 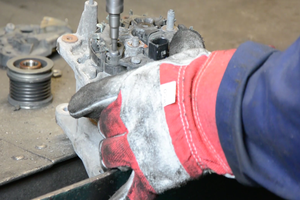 Generally, the total remanufacturing industry in the UK employs over 50,000 people, contributes around £2.4 billion to GDP with the potential to increase to £5.6 billion, recovering around 270,000 tonnes of materials, saving an equivalent 0.5% of total UK carbon emissions compared to new equivalents. This includes products as diverse as washing machines, ink cartridges, computers and boilers: the environmental impact can clearly be seen. The automotive industry is considered to be one of the most environmentally-aware manufacturing sectors. A number of EU directives, driving a shift in business practice, can be seen to have contributed to this awareness. In 2002, the EU introduced the End of Life Vehicle Directive, which requires vehicle manufacturers (VMs) to reach the new vehicle goal of reusability and/or recyclability of at least 85%, and reusability and/or recoverability of at least 95% by weight, if measured against the international standard ISO 22620. The need to consider the recovery of a product’s traditional disposal is required to combat the environmental damage caused by the discarding of end of life products. Product recovery can be used to minimise the demand for energy and raw materials and the environmental impact of waste. Product recovery proposes that the management logic of the system is changed from an ‘open’ production system to a ‘closed’ one of variable length, as demonstrated below. The open loop describes a process which starts by taking resources from the ecosystem. The raw materials and energy are channelled into the transformation process, and, finally, the process ends with landfill disposal or incineration process. For this situation to be sustainable, the consumption of natural resource needs to be lower than the ecosystem’s ability to regenerate them. By contrast, in the closed loop scenario, supply chain recovery activities are undertaken which delay the product disposal by starting new production cycles on the product, before treatment and disposal. Remanufacturing is currently playing a significant part in the sustainability and economics of the automotive industry. 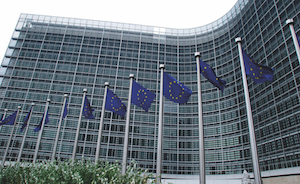 European regulations for end-of-life have forced VMs to consider recycling when designing new models and remanufacturing is helping to meet environmental targets in relation to greenhouse gasses and preserving the earth’s natural resources by reusing them, rather than just sending unwanted material to landfill sites. Also, as more new technology is being incorporated into modern vehicles, components are becoming more expensive due to their complexity and, sometimes, as a result of the materials used in their construction, such as platinum, palladium and rhodium in catalytic converters. Remanufacturing of these components preserves the precious metals used and can offer a significant saving over a new replacement component. A good remanufactured part will perform as well as, if not better than the original part, since any design faults will be engineered out ensuring the reliability of the finished remanufactured part. However, remanufacturing is also facing significant challenges from the changing technology. This is due to the continual investment required and the lack of information available to independent remanufacturers. Also, changes in drivetrain technology to electric and hydrogen fuel-cell may mean that, moving forward, there are not as many wearing parts to remanufacture. Currently, remanufacturers supplying the automotive aftermarket are facing competition from cheaper quality copy products, which are driving prices down and affecting the overall viability of the remanufacturer. There is clearly a case for government intervention, as it is in the national interest to support remanufacturing due to its green credentials in helping to meet national and international environmental targets. There also needs to be a strong independent remanufacturing industry to ensure that the original equipment manufacturers do not establish a monopoly, which is not in the interest of the consumer or the automotive industry, in particular, the automotive aftermarket. 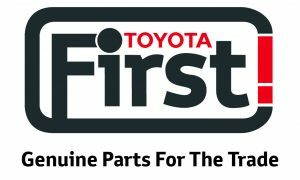 Many people now consciously look at the environmental issues when replacing personal vehicles, so our ‘Captains of Industry’ need to consider the implications of their purchasing decisions when selecting parts to stock in their businesses. We all have a duty to future generations to protect the environment, and the UK remanufacturing industry is well-placed to serve the sector, being able to accommodate short production runs and offer cost-effective replacement parts, particularly for less popular applications. Autoelectro is leading the way for UK-based remanufacturing, having invested heavily in remanufacturing processes, some of the most advanced test equipment in the world and an industry-leading website, which allows customers to track and allocate outstanding surcharges. If properly managed, it can result in trading virtually surcharge-free; thus, removing one of the obstacles of supporting remanufactured products. Clearly, remanufacturing can play an important role in protecting our environment, but also by promoting the benefits of remanufactured product and educating the end-user, without necessarily compromising margins. The automotive sector is trying to be more environmentally-friendly, with new technologies being introduced to new cars, and aftermarket industry influencers can play their part by considering remanufactured product whilst driving their latest low emission vehicle. We have an obligation to protect our planet for future generations. COMMENT: WHY DO WE DEMONISE DIESEL? We hear about diesel being bad, but can someone point me to a person that has died from diesel fumes – and I mean has actually died from diesel fumes, and not ‘diesel fumes may have contributed to the death of this person’? Can you kill yourself with diesel fumes? Yes, but it would take a while. Can you kill yourself with petrol fumes? Yes, in minutes. So which is the most dangerous: one that may harm you or one that will kill you? We have direct-injection petrol vehicles that are said to be clean, but it seems that these produce even smaller particulates than diesels. These direct injection petrols are said to achieve MPG figures close to diesel engines, but can you tell us which models these are? The Ford Ecoboost in the Fiesta and Focus are getting around 38mpg in real life Cornwall, but a 1.2 tdi Polo gets around 65mpg. Petrol vehicles have catalytic converters fitted, but unless the engine is warm and the car is being driven steadily are a lot less efficient than the powers that be and popular media would have you believe. There are lots of questions that I’d like answers to. For example, why are we allowed to fit parts not homologated to the vehicle when it was new (and had to pass homologation)? Also why no Petrolgate? As we all hear stories of manufactures switching off systems with updates, as in the real world these systems do not work correctly or give bad driving experiences. It would be cynical, but I could suggest that those in power are making little attempt to speak up for diesel, as the fuel tax revenue from the more efficient motors is far smaller than that which is generated from petrol. 18 to 20 percent of the pollution in cities is caused by vehicles. Should we not be more concerned with the cause of the other 80-82 percent? 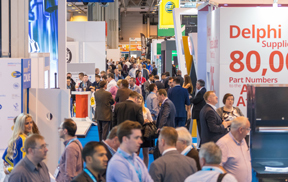 A number of suppliers have been confirmed as exhibitors for the Automechanika Birmingham show to be held in 2019. Big names already booked include Schaeffler, ZF, Denso, Delphi Technologies, Valeo, Bosch, Hella, Bilstein Group, NGK and Yuasa. The 2019 edition will be the last annual show before it switches to a biennial format. This was in response to a number of larger visitors expressing concerns that exhibiting at both Frankfurt and Birmingham in the same year was too much of a stretch. Show bosses are predicting more than 600 exhibitors and as many as 12,000 delegates for show, now in its fourth year. In America, I’m interested to see some of the factor chains that we so often write about. I stop in at a branch of NAPA to ask some questions and to pick up some own-brand bulbs (which turn out to have been made in the Far East). 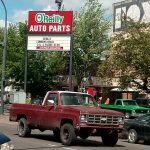 I also note a factor called O’Reilly which, in common with most Irish-american businesses, is covered in Irish cliches. I wonder what Team P.R Reilly (an actual Irish factor) would make of it? It’s a pleasant summer afternoon for a drive down the A3 to Melksham for a visit to the factor show (covered in Connections). It was pleasing to see a good number of garages turn up to see what the suppliers have to offer. It’s just me getting the magazine out this month… I had better get on with it.First of all, I have a meeting with Alastair Whatmore and the PDP in Doncaster. The news, as I’m sure you are all aware now, is that Jim Mazza has joined their ranks. From there is is a short run to see Colin Smit from brake manufacturer Lumag, where we spend an interesting hour or so chewing the fat of all the changes in the aftermarket at the moment. There’s no rest for the wicked… This is certainly true in the pool car as the drive from Doncaster last night to my next appointment in Barnstable this morning turned out to be both longer and far hotter than I had expected. However, it was good to look at Ultra Parts and even more interesting to visit a Parts Alliance Southwest branch. For all we have written about the house-branded branches, I had never actually visited one before. t make knowing what to check before presenting it that much harder. The garage discovered it needed drop links and rear springs, which I thought was getting away pretty lightly, until I got a bill for £500… Next time, I’ll supply the parts myself. A supply deal has been struck between Autoelectro and accessory parts retailer CAAR. 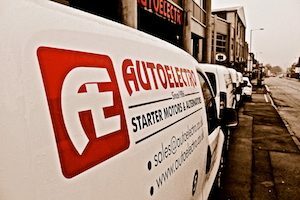 The partnership will see the latter take advantage of Autoelectro’s extensive portfolio of remanufactured starter motors and alternators including its surcharge-free non-exchange (NEX) units. In addition, the former will be rolling out its recently-launched Active Inventory Management System (AIMS) to CAAR’s supplier base; allowing them to maximise their chances of returning old core as well as keeping close tabs on any outstanding surcharges owed, following the company’s new pricing strategy. 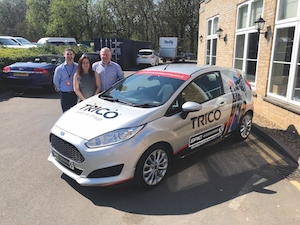 Wiper blade brand Trico has presented Epic Accessories with a Trico liveried Ford Fiesta van, after the latter achieved its target during the former’s three-month promotion last year. The vehicle was handed over to Epic Accessories owner Samantha Gutteridge at the A1 buying group’s spring trade show, which took place at the Whittlebury Hall in Towcester last month.